The Duke and Duchess of Cambridge's first born Prince George started school today. The third-in-line to the throne is attending £17K-a-year Thomas's Battersea and today marks his first day but his mother Kate Middleton - who is pregnant with the couple's third child - was absent from the pivotal moment, Kensington Palace confirmed moments before he was pictured arriving with dad Prince William. Prince George looked understandably nervous today as he clutched his father Prince William's hand on arrival to his first day at school at Thomas's Battersea in South London. The third-in-line to the throne is attending the £17,000-a-year private school and today marked his first day but his mother Kate Middleton - who is pregnant with her third child - was forced to miss the rite of passage as she remains bed bound with severe morning sickness. The future king was dressed in the school’s uniform which comprises navy blue shorts, a light blue shirt, which was unbuttoned at the top, and a navy jumper featuring the school’s emblem in red. The Royal Highnesses were met by the Head of Lower School Helen Haslem who was pictured shaking hands with the Duke and Duchess of Cambridge’s first born. Kensington Palace confirmed this, tweeting: "TRH were met by the Head of Lower School, before The Duke took Prince George inside to his reception classroom.” The Palace has also confirmed the Prince will be known as George Cambridge to his classmates. Early in the morning, it was announced that Kate Middleton would not be present and it’s thought this is due to the fact she’s currently suffering from Hyperemesis Gravidarum which causes severe vomiting. 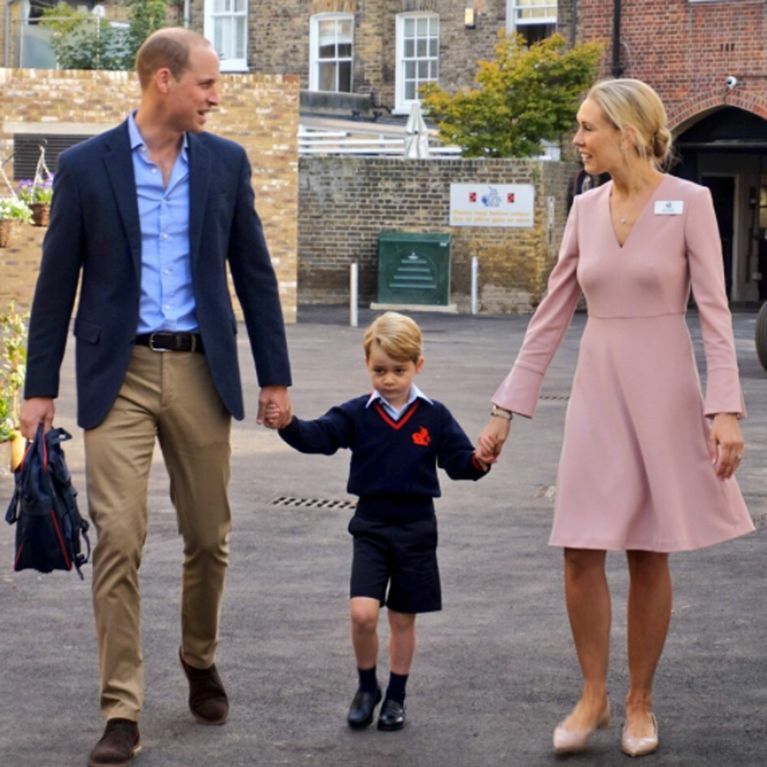 The tweet read: “Prince George will this morning attend his first day of school at Thomas's Battersea, accompanied by his father The Duke of Cambridge."